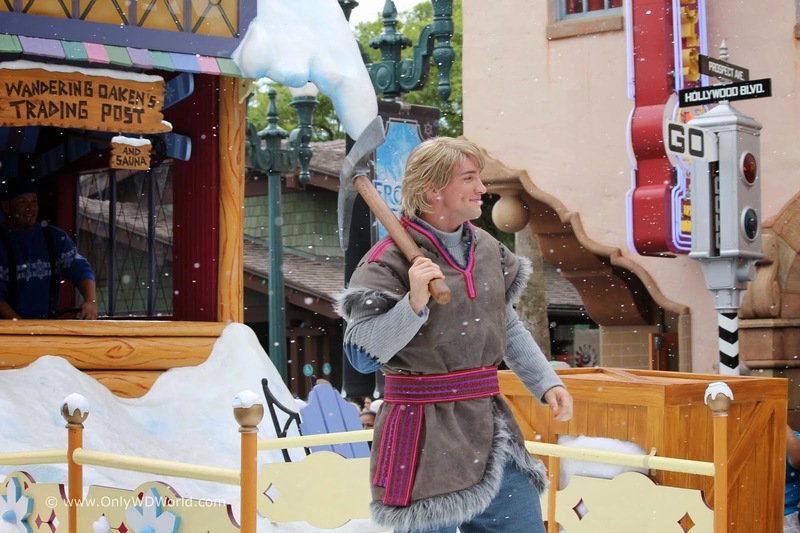 Disney's Hollywood Studios has been transformed to a world of Frozen Summer Fun! 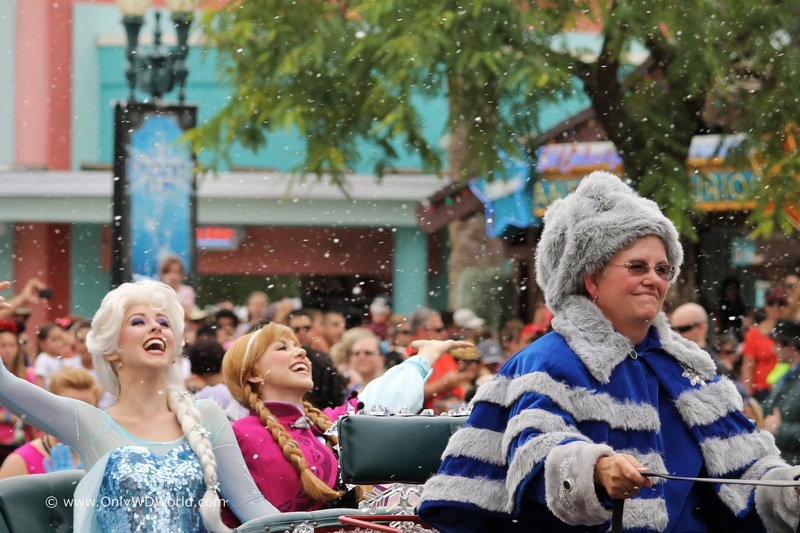 Each day at 11:00am Anna and Elsa arrive at Hollywood Boulevard as part of their goodwill tour of neighboring kingdoms via horse drawn carriage. 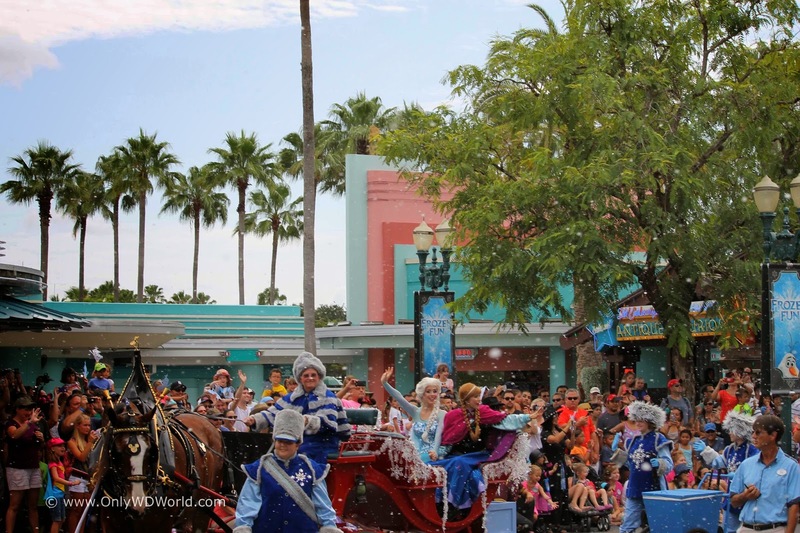 Frozen fans will delight in the changes that have been made to Disney's Hollywood Studios for the summer. 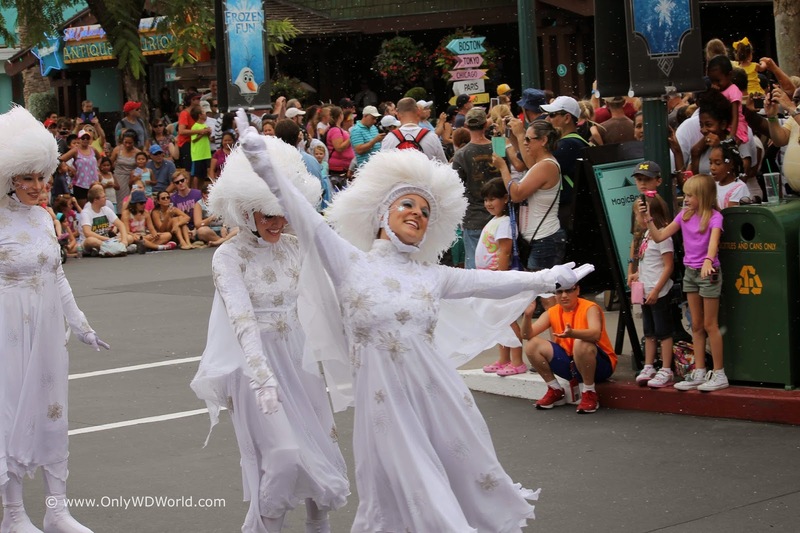 At the heart of the fun is the daily parade called: Anna and Elsa's Royal Welcome. 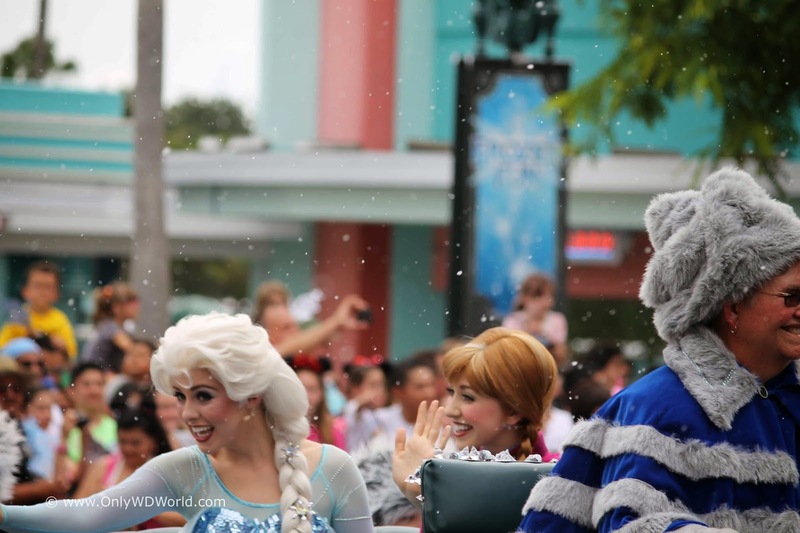 It may appear to be a typical hot Florida summer, but some Disney magic can make it snow for favored guests like our Frozen royalty. 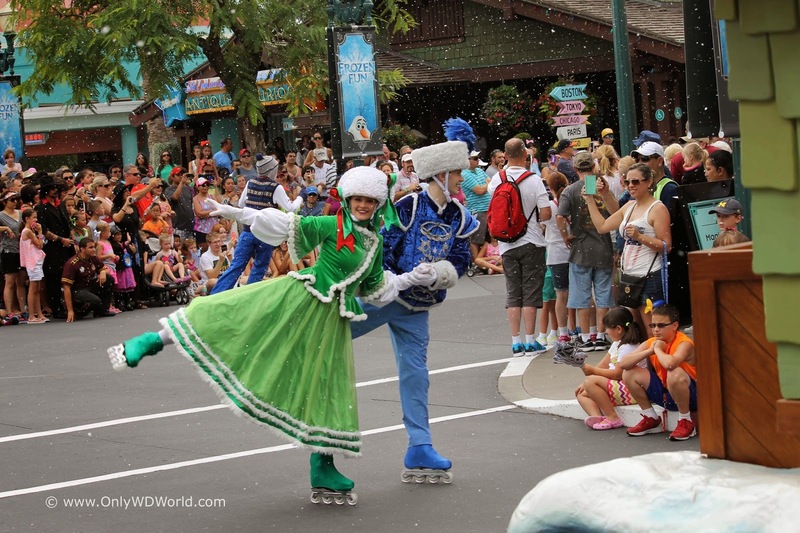 This Royal Welcome is unlike one seen before at Disney World, filled with skaters, skiers, ice choppers and more. The parade starts off on Hollywood Boulevard near the park entrance and continues towards Sorcerer Mickey's Hat. 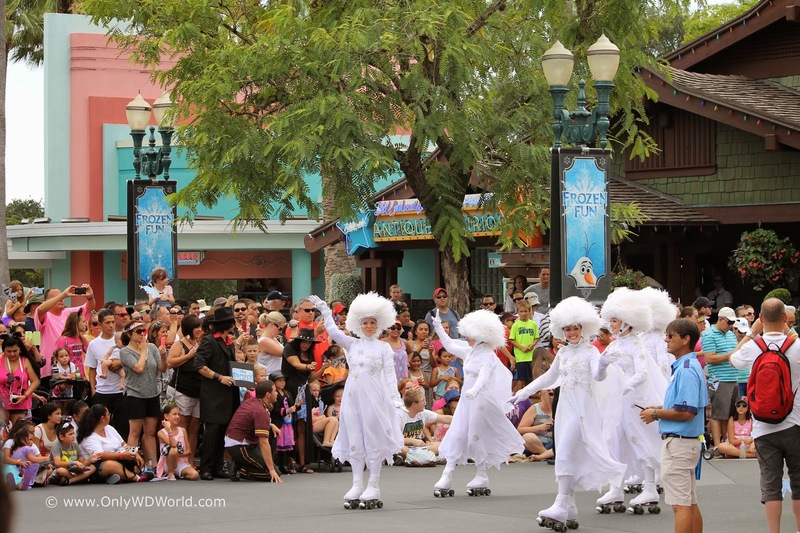 Leading the way are a group of skaters dressed in beautiful white costumes. They made their way skating down the street with graceful turns and formations. 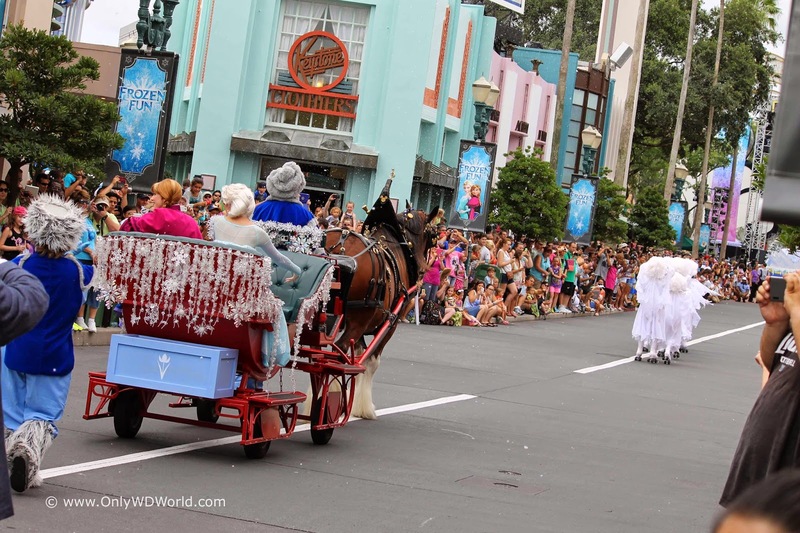 The skater were followed by Anna and Elsa in a horse drawn carriage. 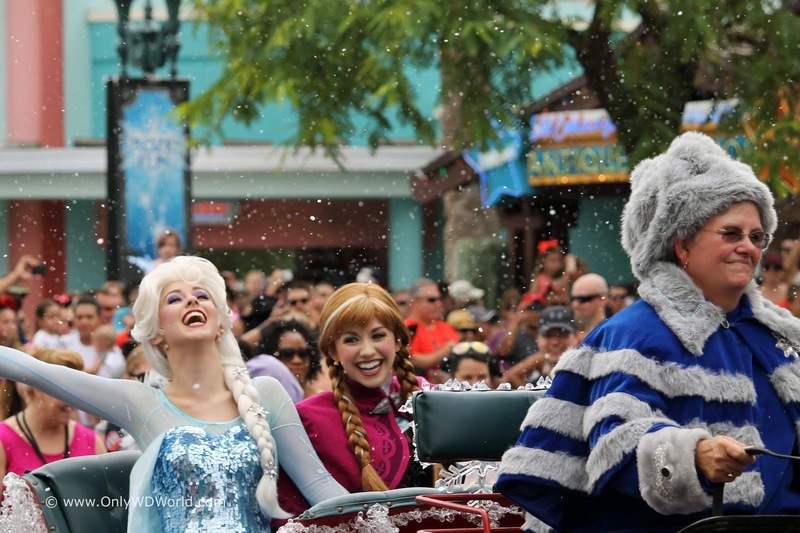 The crowd was thrilled to see the newest Disney Queen and Princess. 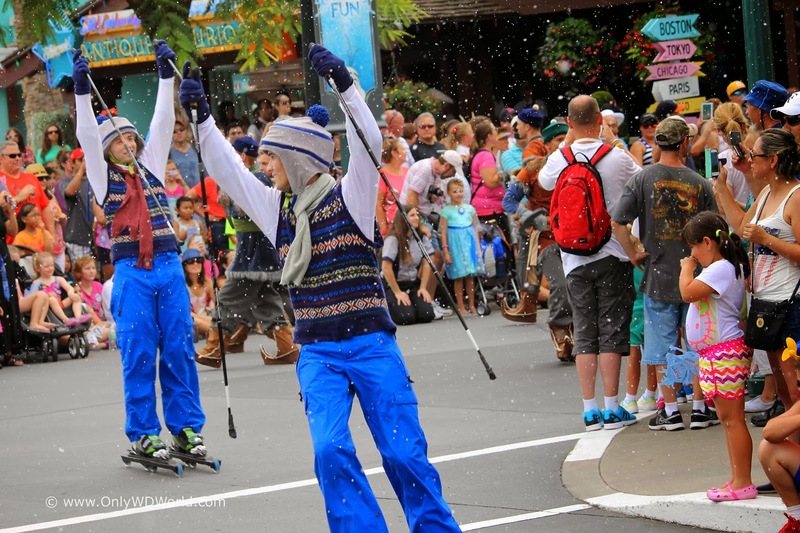 The pair from Frozen greeted the crowds as they made their way down Hollywood Boulevard. In the above photo you can see a glimpse of Hollywood Boulevard with the skaters in formation ahead of the Royal Carriage. The next group in the parade was a collection of royal flag bearers and the first float in the first float in the parade. 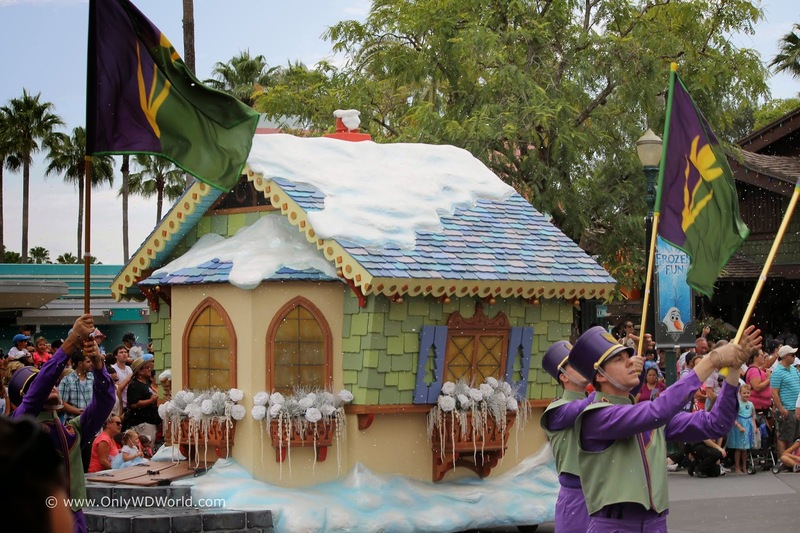 Surprisingly there was no people (or characters) riding this float. They were followed by a group of couples skaters and then some skiers that showed off their skills. The constant snowfall really makes this Frozen fantasy great. Click on some the pictures to enlarge and you can see the falling snow. Next up are the ice choppers. They make their way along the route performing in unison with their pick-axes. 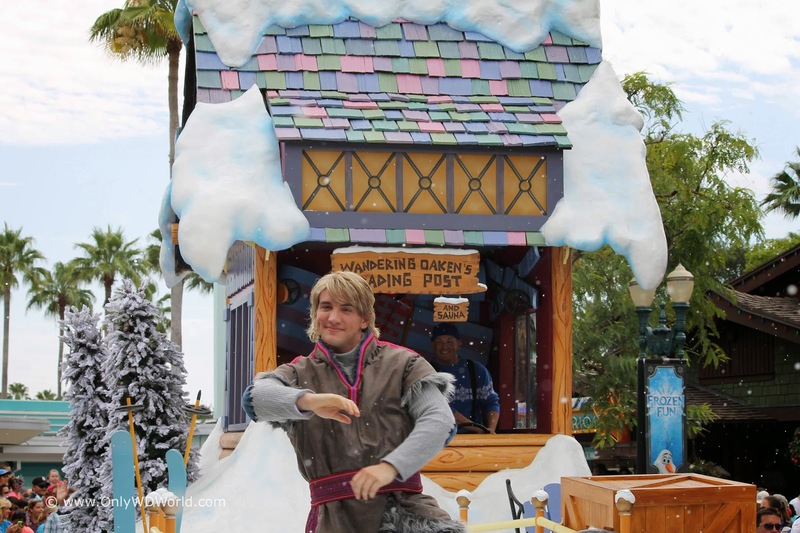 Last, but not least is Kristoff, who is perched on the Wandering Oaken's Trading Post and Sauna float. He did a great job greeting the crowds as his float passed by. 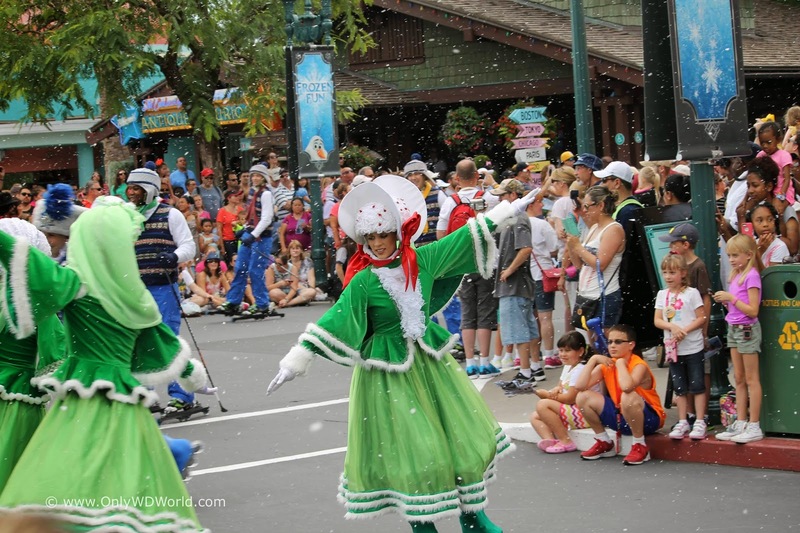 The parade made its way to the Frozen themed stage at Sorcerer Mickey's Hat where a brief presentation was made to Anna and Elsa. 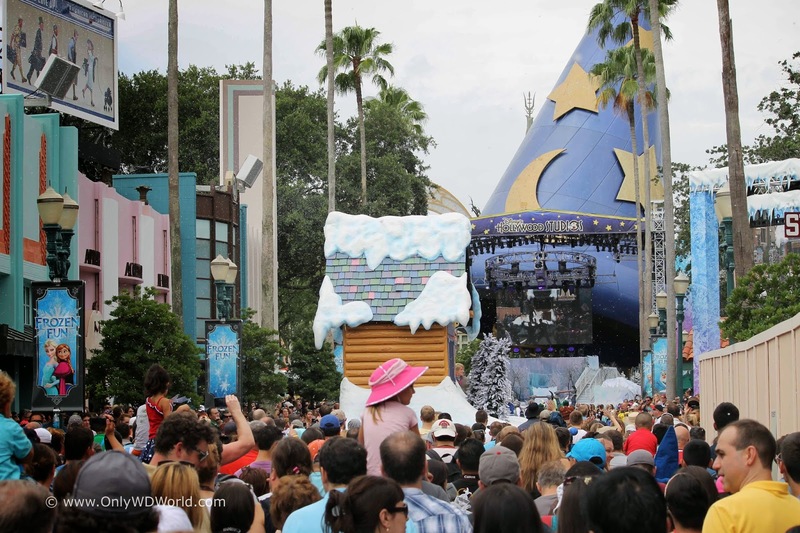 They were joined by Olaf on video screen for a sing-a-long with the crowd. 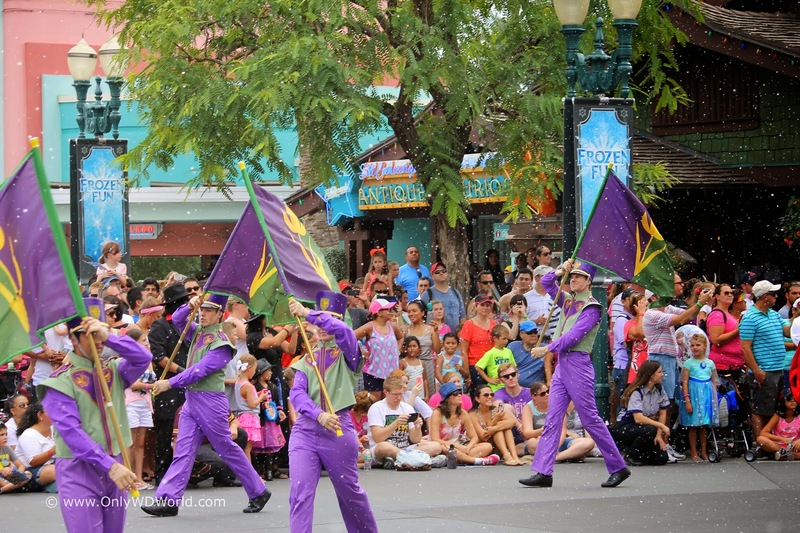 Lastly the parade re-started and continued to make its way towards Star Tours and finally exiting the park there. This addition to the route allowed many more people to get a great view as Hollywood Boulevard was packed. 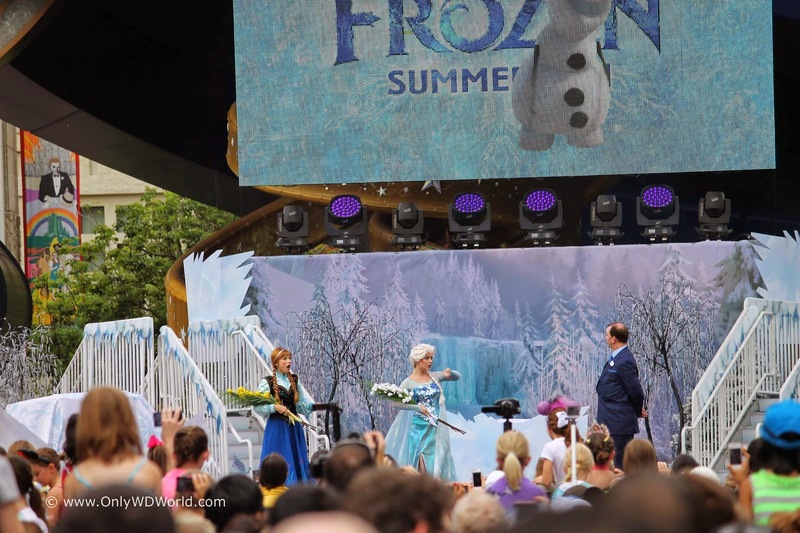 Frozen Summer Fun got off to a great start and fans of this animated instant classic will love Anna and Elsa's Royal Welcome. 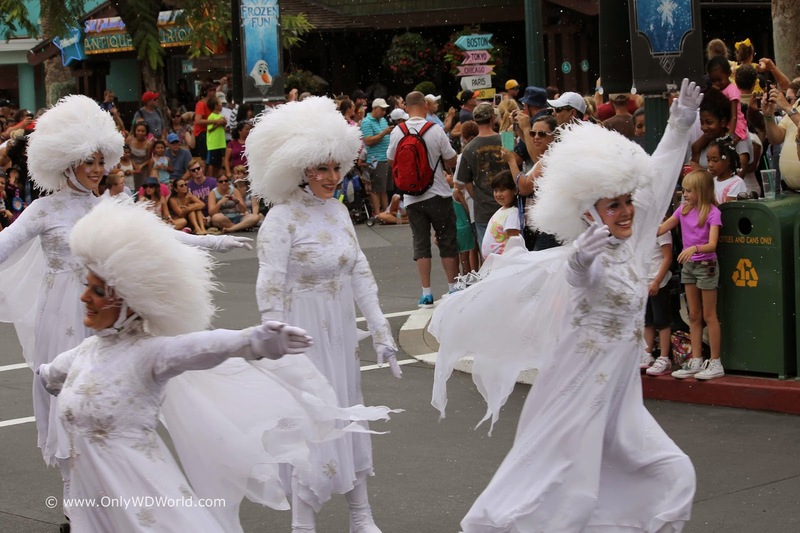 Although short, it provides a great view of Disney's two hottest stars and provides for the crowd interaction at the stage. 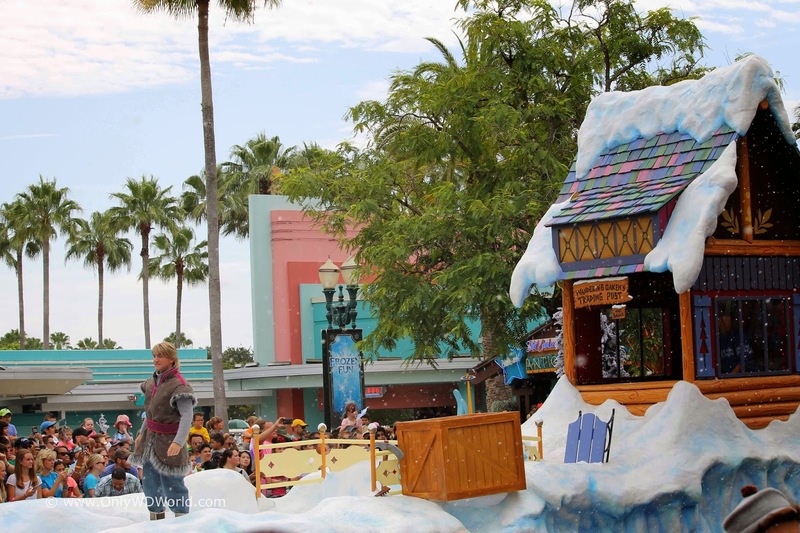 We absolutely loved the snowing effect on Hollywood Boulevard as it really made you believe it that these Frozen guests fit right in the hot Florida sun. 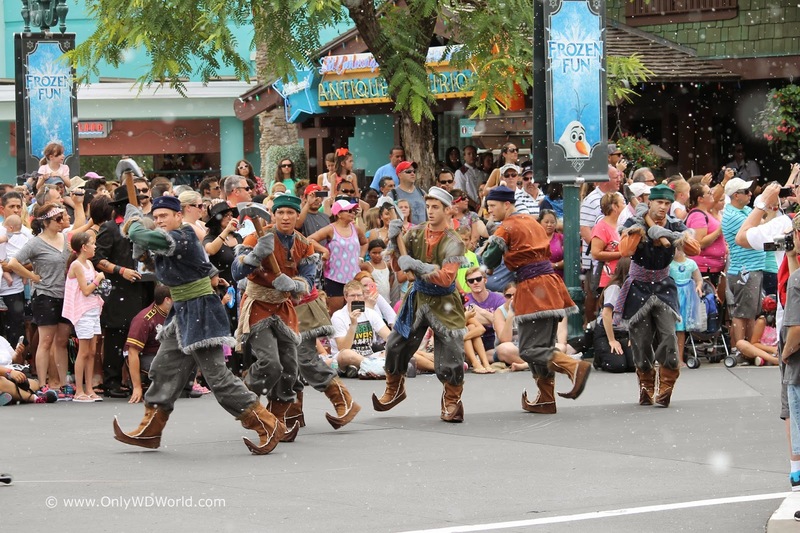 Definitely something that you want to see if you will be at Disney World this summer for your vacation! 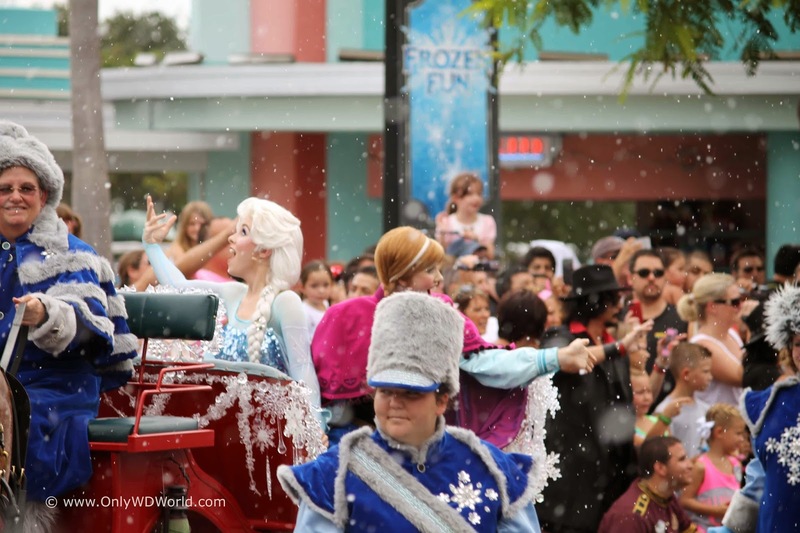 0 comments to "Frozen Summer Fun - Anna and Elsa's Royal Welcome"